WINTER OPEN DAY aka MINCE PIES IN THE WOODS. Sunday 16th December 2018, 11am to 2pm. 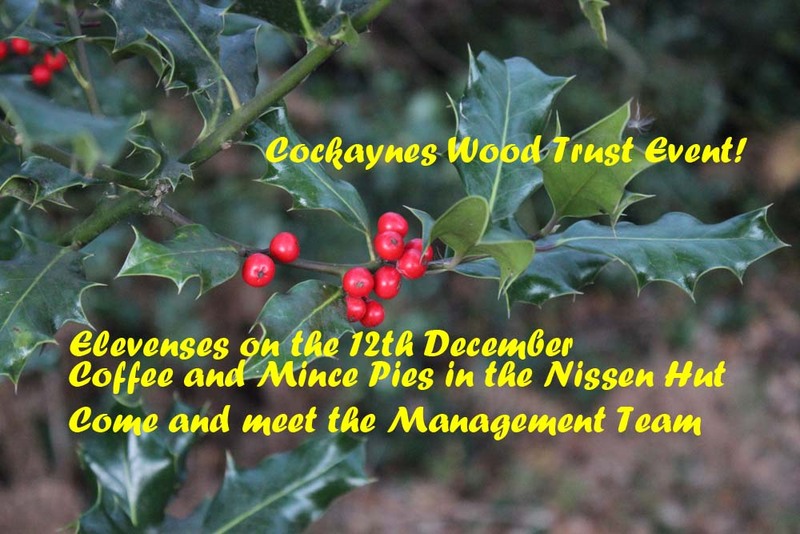 Come and join us for a walk around the reserve and collect some Holly for decoration . Hot drinks and mince pies will be available at the Nissen Hut for a small donation to site maintenance. The yard will be open for parking until about 2pm. Tasks will vary with the season and management plan. Ongoing tasks include woodland coppice management, footpath maintenence, scrub clearance and tree planting. Tools provided and instruction and supervision where needed. NB: there are no on site toilet or handwashing facilities during work parties. All volunteers welcome, please wear suitable footwear and clothing to protect your from the weather. Meet in the yard from 10am. On site car parking in the yard area. Dates: February 12th, March 5th, April 2nd, May 7th, June 4th, July 2nd, August 6th, September 3rd, October 1st, November 5th, December 3rd. (January 7th 2018) Download dates and contact details here. Sunday 25th June 2017 11am to 4pm approx. 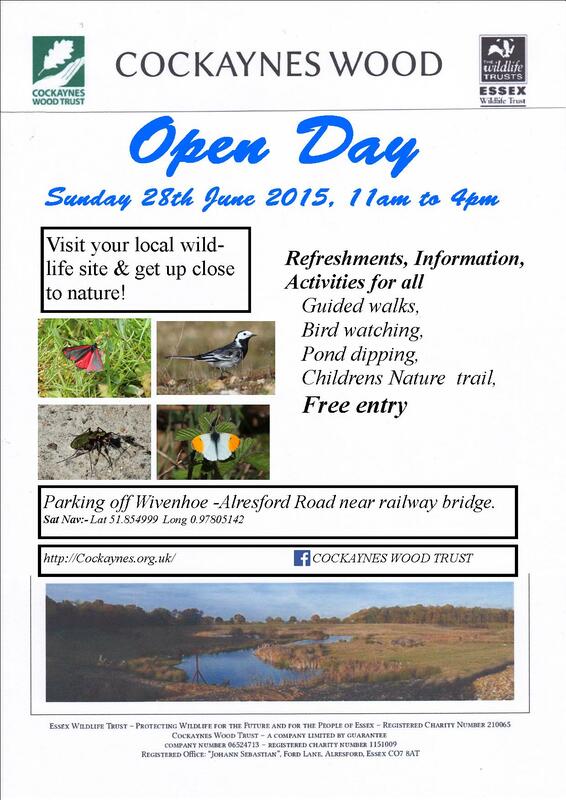 Refreshments, information, guided walks, pond dipping, bird watching. (Further activities to be confirmed). (Any funds raised on the day will be shared between Cockaynes Wood Trust and Essex Wildlife Trust.) On site car parking. Date and time tbc. Usually held on a Friday evening after 8.30pm between May and September. Details to follow. Bats and moths both begin to emerge at dusk. Friday 7th July, meet at the railway bridge entrance at 9.30pm weather permitting. Wear suitable footwear and bring a torch as it will be quite dark when we finish! Open / Activity Day to coincide with National Insect Week. Saturday 25th June 2016 11am to 4pm approx. Saturday 12th December 2015 11am to 2pm approx. We will have festive home made mince pies and hot drinks in the nissen hut at the weighbridge yard. An opportunity to come for a chat, refreshment and meet some of the management team. On site car parking in the Yard. Friday 28th August 2015 8.30pm till midnight approx. Weather dependant, will be cancelled if raining. Up to 4 ‘moth attracting’ lamps will be in or near the Yard area. Come and see the variety of moths caught (released unharmed later) and identify them with the help of our experts. The records collected are then sent to a national database to assist with conservation. Flash photoghaphy is welcome. A small torch and sensible footwear / clothing is advised. On site car parking in the Yard. Sunday 28th June 2015 11am till 4pm. Refreshments, information, guided walks, pond dipping, bird watching. (Further activities to be confirmed) Free entry and on site car parking. Friday 22nd May 2015 We’ll be setting up the moths traps/lamps from 8.45pm onwards. Together with members of the Essex Bat Group and the Essex Wildlife Trust moth team join us for an evening on site looking for bats and moths. Learn how to use a bat detector and to identify some of the many local moth species. Hot drinks provided, donations welcome. Free entry and on site car parking in the yard via railway bridge entrance. Saturday 3rd May 2014 at 2.30pm. Short walk (30mins) from the car park, entrance off Alresford Road near the railway bridge. Longer walk (1hr) from public footpath sign Cockaynes Lane, Alresford. Call 01206 82 6418 for more details. Sunday 28th July 2013 from 8.00 p.m. rescheduled from Saturday 27th July. Join Ted Benton on Saturday 20th July 2013 at 2pm to learn more about dragonflies and their conservation. Contact events@cockaynes.org or Simon on 07765 562068 to book a place. Suggested donation £2 per adult £1 per child. All children must be accompanied by an adult. There was an open day on Saturday 18th May 2013 with guided walks, pond dipping, children’s craft activities, demonstrations of pole lathing and willow weaving. Saturday 4th May 2013 Cockaynes Wood Trust Dawn Chorus Walk. Meet in the former quarry yard at 5 am. Walk starts at 5:15 am and finishes at 6:45 for breakfast. Charge: £10 per adult, £6 per child (including breakfast). Booking essential – numbers limited. Saturday 27th October 2012 Cockaynes Wood Trust Family Nature Ramble 1pm – 3pm. The event is free. Children (aged 3-12) can take part in a scavenger hunt. On the evening of Friday 10th August 2012 Cockaynes Wood Trust will be holding a Bat Evening on the site. Access will be as for the Open Day,i.e. via the former Brett’s site entrance, off Alresford Road, Wivenhoe, just North of the bridge over the railway. Plenty of parking will be available in the former quarry yard. Meeting at 20.15 hours. Please bring suitable clothing and footwear – it could be wet underfoot – and bring a torch. And mosquito cream if you’re vulnerable. Tuesday 10th July 2012: Cockaynes Wood Trust and Essex Wildlife Trust on-site Moth and Bat Evening. Unfortunately this event had to be rescheduled due to bad weather. A Bat Evening will now be held on 10th August. A Moth Evening will be held later in the summer. There was an open day on 12th May 2012, with guided walks, pond dipping, bird watching, demonstrations of pole lathing, and willow weaving. The lease for the Cockaynes site was acquired jointly with Essex Wildlife Trust towards the end of 2011.